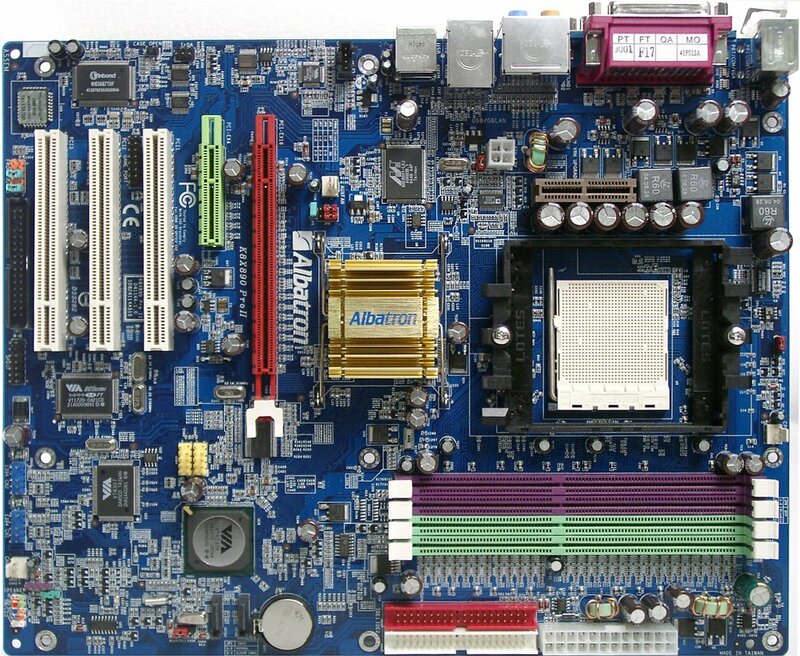 This Albatron model is the first of production motherboards on K8T890 in our test lab. This chipset is nothing more than a transitional product in the era of PCI Express advent. But if you are not disturbed by the idea to use a PCIE video card instead of an AGP modification, K8T890 has no flaws. On the whole, this motherboard is sturdy rather than luxurious, but considering its low price it's an excellent option which must be popular among users. You cannot say that this motherboard is oversaturated with features, so the board layout is rather convenient. The "classic" complaints include only the audio input at the rear panel (the audio cable will have to be laid across the entire PC case, but it's an inevitable price for the shortest possible analog audio section). The row of connectors along the left edge of the PCB is also not very convenient to plug cables, and a cable from the FDD connector may fail to reach the floppy drive in high towers. The PCIEx4 slot instead of usual PCIEx1 is an original solution: indeed, PCI Express expansion cards are not to be seen on the market so far; thus there is no sense in using all the four chipset PCI-E channels for four expansion slots. At the same time it's a pity the hardware capacity stands idle :). 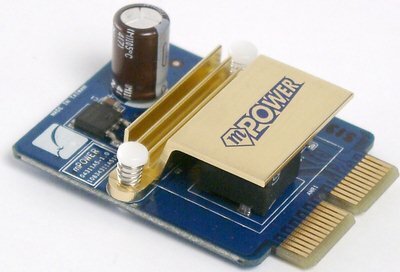 As a result of this solution, users can use either an x1 expansion card or an x4 expansion card positioned for servers (connectors are backward compatible). Access to some jumpers is hampered even when the motherboard is not installed in a PC case (they stick too close to each other), a short description of their functions is provided on the PCB. InterVideo WinCinema Pro to play DVD (InterVideo WinDVD 4) and listen to music (InterVideo WinRip 2) – outdated versions. General performance: Very good (details). The audio controller from VIA is supplemented on this board with a good codec from the same company producing very good results. We have already tested such solutions before (also from Albatron – it's actually the only motherboard manufacturer that makes such experiments with sound). This time the company has considerably improved the PCB layout and the resulting noise immunity of the analog section. The results are obvious: low level of distortions, decent noise level and dynamic range, almost ideally even frequency response. Besides, this motherboard supports 7.1 channel audio output and 24 bit/96 kHz format – it's no High Definition Audio, but very decent indeed. Thus, integrated audio is the real advantage of Albatron K8X890 Pro II over its competitors. Well thought-out pricing policy of this company may stimulate sales of this top model. Watch Dog Timer (automatically resets BIOS settings into the safe values, when a system freezes due to overclocking – it saves you the trouble to open up the case and do the same thing with a jumper). A set of jumpers to use with external VRM (mPower) It's not clear why there are full 4 jumpers. Besides, their "code combination" is different from the specified in the manual and on the motherboard. We used BIOS R1.3, the latest available BIOS version at the time of our tests. The mentioned BIOS parameters are available in this version, but the viability of non-standard settings hasn't been tested. We have already come across performance differences among motherboards for Socket 939, though a memory controller in a K8 processor is integrated into a core, and so even a chipset has practically no influence on performance. It can be explained either by a motherboard not being able to start up with minimum timings or, as we have recently seen, by the 1T/2T memory operating mode. The 2T mode allows stable operation at higher frequencies for a larger number of modules but at the performance cost. 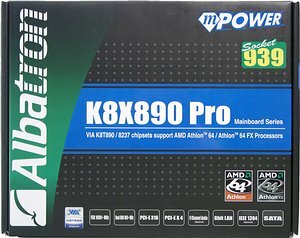 In fact, Albatron K8X890 Pro II is the first model on new chipsets (with PCI Express) we reviewed, which allows direct selection of 1T/2T mode in BIOS Setup. As a result, (with 1T) the K8T890 chipset is fully exonerated and the performance of all chipsets for Socket 939 is again practically identical.